Hannah's Choice F1' has excellent resistance to powdery mildew races 1 and 2 (Podosphaera xanthi) and some tolerance to Fusarium root rot (Fusarium oxysporum f. sp. melonis) race 2. In addition, it has resistance to watermelon mosaic virus (WMV), papaya ringspot virus (PRSV), and zucchini yellow mosaic virus (ZYMV). 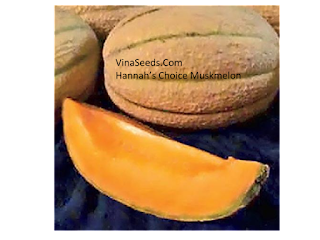 This is the first commercial melon to have combined resistance to these three potyviruses. Also, it has shown some field tolerance to spider mites (Tetranychus urticae). Lastly, it has shown some field tolerance to downy mildew (Pseudoperonospora cubensis), angular leaf spot (Pseudomonas syringae pv. lachrymans), and gummy stem blight (Didymella bryoniae). In 2001, 2002, and 2003 it was grown in replicated trials in New York and in 2002 and 2003 in Oregon.